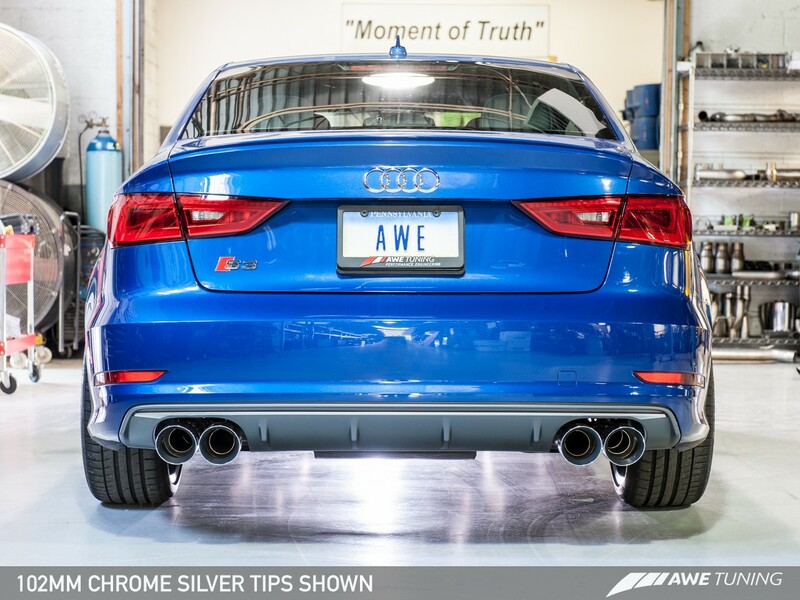 AWE 8V Audi S3 exhaust system is capped off with attractive 90mm or 102mm slash cut tips featuring the AWE Tuning logo. These tips are double walled to ensure a mirror finish even under hard usage. Choose between the classic Polished Silver tips, and luscious Diamond Black tips to help your car stand out from the pack. Each tip is individually adjustable, so stagger and depth into bumper can be set according to personal taste. 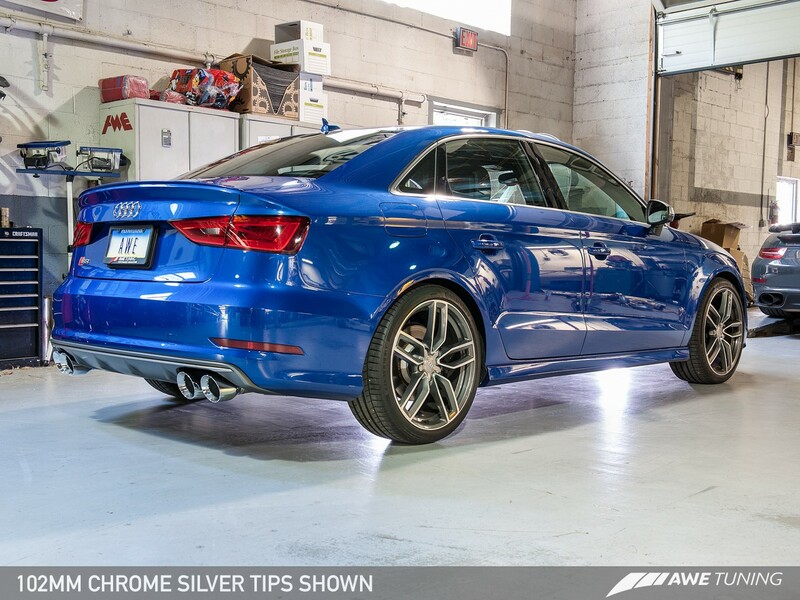 Audi S3 owners looking to fine tune the sound even more, AWE offers Resonated and Non-Resonated Downpipes. AWE Resonated Downpipes (strongly recommended for S-tronic cars) feature resonators larger than the stock units in order to produce a mellow sound volume. Their non-resonated downpipes are suited for owners seeking a "loud" and aggressive sounding system. Each 8V Audi S3 8V Exhaust is TIG welded by hand, and flange openings are size matched to their ports, all to produce the smoothest flow possible. It is this intensive attention to detail that sets AWE Tuning exhaust products heads and shoulders above the rest. 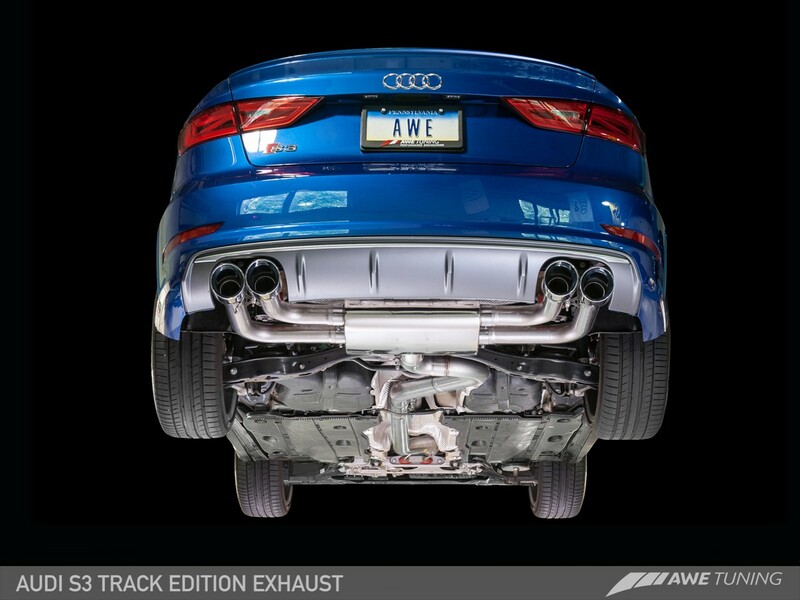 Questions about this AWE Tuning Track Exhaust for 2015-16 Audi S3 Sedan [8V] ? Our Modification Experts are standing by and available to help you, online or by calling 714-582-3330. ModBargains also offers expert installation and can install this upgrade for you. Call today!